George Miller’s 2006 film, Happy Feet, was a fun, original and wonderfully off-the-wall animation with a very powerful message alongside its infectious mixture of rhythm and wit. With DreamWorks producing a fantastic sequel in the form of Kung Fu Panda 2 earlier this year, hopes were high that Warner Bros. would deliver something different and exciting to contend with Fox in Happy Feet Two. Following on from the first film, we are already acquainted with Mumble (Elijah Wood), Gloria (Pink) and their new and very cute bundle of fun, Erik (Ava Acres) and it appears Mumble’s lack of singing ability has been transferred into Erik’s lack of dancing talent. However when Erik’s true gift is unveiled it is as surprising as it is delightful and a great little moment within the film – dads, you may need some tissues at hand. Although returning as both Ramon and Lovelace, Robin Williams feels oddly lacking from this sequel, feeling more scripted than we’re used to and taking a backseat to the vast amount of other characters taking up screen time. New addition Hank Azaria is once again on incredible form as The Mighty Sven, the ‘fake’ penguin who little Erik aspires to after watching him fly. Another accent perfected, Azaria brings a lot of light-hearted comedy to the sequel, but isn’t particularly key to the main story, serving much more of a moral purpose. Definitely involved in the main events are Seymour (Common) and his rapping son, Atticus (Benjamin Flores Jr.), who remain upbeat throughout and save the middle third from being entirely bereft of penguin humour, Atticus being a great deal of fun to watch as the self-assured, freestyling, fluffy ball of attitude. Courtesy of Brad Pitt and Matt Damon – one of Hollywood’s less likely double acts – Will and Bill the Krill completely steal the show. Although they don’t have a great deal to do with the film’s main narrative, Pitt is in his absolute element as the delusional Will, a Krill going through an identity crisis, with Damon’s play-it-safe Bill his trusty and loyal companion. The duo take part in some of the film’s best set pieces, with the 3D at its most effective (and it is extremely impressive throughout) and sheer craziness at its peak. Whether watching the Krill being chased through the entire food chain, skua attacks or dance sequences, it’s impossible not to smile and be completely lost amongst the jellyfish and beautiful Northern Lights when the film is at its most comfortable and best. Unlike the previous film, the environmental connotations are spread throughout rather than in one big helping, with the penguins taking matters into their own flippers much more this time around. This has resulted in a film that is far darker in tone, its final third doused in negativity and not quite knowing what to do with itself. Handy, then, that Pink is involved this time and appears to have been utilised for her singing talents far more than her acting, leaving Brittany Murphy desperately missed and Gloria sidelined. Although morally fitting, her full-length song in this middle third slows the pace even further and is at times slightly uncomfortable. The songs themselves are not utilised as well as the first film where we followed each penguin trying to find their own ‘Heartsong’, but there are some great little surprises and the sheer power and sense of triumph and togetherness ‘Under Pressure’ brings towards the film’s close is as spine tingling as it is impressive. Ultimately a film about coming together, this is reflected in how Miller has tried to give everyone an equal say, leading to too much ‘alien’ interaction. Where the initial sighting of a human in Happy Feet was actually quite shocking, here they end up feeling gimmicky and borderline annoying, eradicating any initial sense of fascination and mystery. 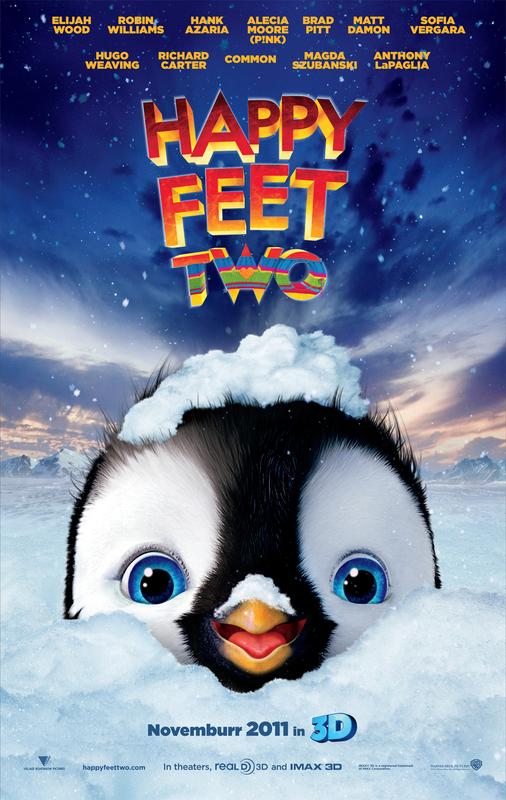 When it’s good, Happy Feet Two is pure, delirious entertainment, but away from the near-perfect set pieces, the film seems confused as to quite which storyline to focus on. Whilst the animation is once again impossible to fault, and although it is just as wonderfully bonkers as the first, it just doesn’t feel as fresh. The original is ultimately so much cooler.